Each player has 9 men, colored black and white. The concrete rules are not important for this challenge, but check out the Wikipedia-page if you are interested. Given a grid as input, which represents a certain boardstate, output the total mill count m with 0<=m<=8. Three men of the same color form a mill when they are in a straight row of connected points. b2 to f2 is not a mill since the men are of different color. Also d2 to d5 would not form a mill since the three points have to be connected. The board in the image above contains two mills for example. One from f2 to f6 and one from e3 to e5. The concrete repersentation is up to you you are not restricted to "b" or "w" for the colors. Besides this, your input may not contain any additional information. You don't have to map the points by any kind of values. If you want to take the input as a 2D array, that's fine as well. But keep in mind that not all points in there are used and that you have to consider the connections between them. The input might be empty, in which case you have to output zero (empty board -> no mills). Since each player has 9 men, the input will never contain more than 18 taken points. You may leave out emtpy points in the input and therefore only input points which are taken. The input may be ordered in any way. You can't rely on a specific order. You may assume that the input will always be valid. This means that there won't be more than 9 men of each color and that each point will be unique. Make clear which input format you use in your solution. Providing an example run of your program is hightly encouraged. The input format here is a list of tuples with the coordinates as in the example above as first element and the state of the point second element. 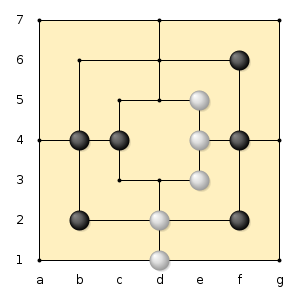 A point taken by white is marked as "w" and a point taken by black as "b". All other points are left out and are empty. The argument is a 3x3x3 array of 1(black), ¯1(white), and 0(empty). The first dimension is along the concentric squares' nesting depth. The other two dimensions are along the vertical and horizontal axis. We have a mill whenever summation along any axis yields a 3 or ¯3, except we must discard the four corners when summing along the first axis. Now we must take care of the special case for the first axis. Breaks a reference string into letter triplets that match up with mill group keys. Input is in the form of an object, where keys are the letters a-x, starting from the bottom left and ending in the top right, moving left-to-right first. Values are 1 for white, -1 for black, and 0 for blank. These examples are taken from OP's examples, converted to the letter-key and number-value object. The first is from the example image, while the others are from the example set. While I'm sure this is not particularly competitive, here's an entry for you. Allowing single-character coordinate names trivially golfs off 51 characters, making this a 166 byte solution. Naming the players 1 and 2 rather than "w" and "b" golfs off 17 further characters. While longer (29 chars) than @ngn's solution, it uses an entirely different approach: The input has the same overall structure as that solution, but all slots are represented as objects. Empty slots (including the non-existing center column) must be empty objects. while all black men must be references to the "black man" object, and all white men must be references to the "white man" object. All the objects may optionally have nice Display Forms for readability, and so the center column can optionally be made invisible. An atop operator, as supplied with AGL (ä), would bring the length down to 27 characters.